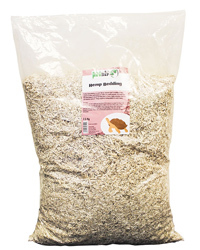 It is made from the dried chopped stem of the Hemp plant to form a highly absorbent, dust free and odourless material. Being completely biodegradable it is safe if eaten. If you are using an under-tank heat mat as your heat source do not use a thick layer of Hemp Bedding as this may cause the heat mat to overheat.